When our Lord reached thirty years from His physical birth, He began His teaching and salvific work. He Himself signified this “beginning of the beginning” by His baptism in the Jordan river. St. Cyril of Jerusalem says, “The beginning of the world – water; the beginning of the Good News – Jordan.” At the time of the baptism of the Lord in water, that mystery was declared to the world: that mystery which was prophesied in the Old Testament; the mystery about which in ancient Egypt and India was only fabled; i.e., the mystery of the Divine Holy Trinity. The Father was revealed to the sense of hearing; the Spirit was revealed to the sense of sight, and in addition to these, the Son was revealed to the sense of touch. 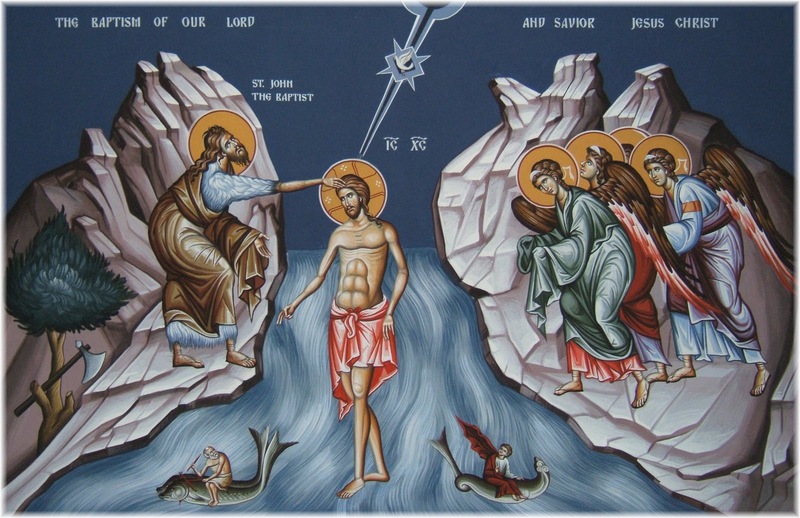 The Father uttered His witness about the Son, the Son was baptized in the water, and the Holy Spirit in the form of a dove hovered above the water. When John the Baptist witnessed and said about Christ, “Behold, the Lamb of God, Who takes away the sins of the world” (John 1:29), and when John immersed and baptized the Lord in the Jordan, the mission of Christ in the world and the path of our salvation was shown. That is to say: The Lord took upon Himself the sins of mankind and died under them [immersion] and became alive again [the coming out of the water]; and we must die as the old sinful man and become alive again as cleansed, renewed and regenerated. This is the Savior and this is the path of salvation. The Feast of the Epiphany [Theophany in Greek] is also called the Feast of Illumination. For us, the event in the Jordan river illuminates, by manifesting to us God as Trinity, consubstantial and undivided. That is one way. And, the second: everyone of us through baptism in water is illumined by this, that we become adopted by the Father of Lights through the merits of the Son and the power of the Holy Spirit. Father, Son, Holy Spirit – God, have mercy on us! “For there are three that bear record in heaven, the Father, the Word, and the Holy Spirit: and these three are one. And there are three that bear witness on earth, the spirit and the water and the blood: and these three are together” (I John 5: 7-8). When we read Holy Scripture, we should be alert to keep an eye on every word. To the rapid reader, for example, this distinction which the Evangelist draws between the Heavenly Trinity and the earthly trinity will not become apparent. Concerning the Heavenly Trinity, he says, “And these three are one;” and concerning the earthly trinity, he says, “And these three are together.” There is an enormous difference between “being one” and “being together.” The Father, Son and the Holy Spirit are One, whereas the spirit, water and blood are only together and are not one. Even enemies could be together as one, but are not one. All the people on earth are together, but they are not one. Water and blood constitute the body and the spirit is the spirit. “For the flesh has desires against the spirit and the spirit against the flesh” (Galatians 5:17). However, they are not one, but they are still together. When man dies the union is broken apart and ceases to exist. Blood and water go to one side and the spirit goes to another side. Whereas the [Heavenly] Divine Trinity in the heavens not only are they together but they are also one. There is also another trinity in the inner heaven of man which should be, not only a unity, but a oneness so that man could be blessed in this world and in the other world. That is the union of the mind, heart and will. As long as these three are only in togetherness, man will be at war with himself and with the Heavenly Trinity. However, when these three become one, so that neither one rules and that neither one is enslaved, then man becomes filled with “the peace of God that surpasses all understanding” (Philippians 4:7), man’s every word, every explanation, every fear and every sorrow. Then the small heaven in man begins to resemble that great heaven of God, and the “image and likeness of God” becomes apparent in man. O Triune God, help us to resemble, at least, those who resemble You. To You be glory and thanks always. Amen.